Shanta Engineering Universal Testing Machines are electro mechanical machines with digital display of load & displacement & pulley belt system for changing speeds. The machines are designed for testing various materials like rubber, plastics, cables, leather, paper, plywood and metals. Tension, compression, bend and flexural tests can be performed on these machines with suitable grips and fixtures. The machines are powder coated for elegant look. The critical components are plated for rust prevention and durability. Facility to mount different load cells. 7 segment digital display of load and displacement. Facility to return of crosshead to home position for next test. Over load & over travel protection is standard. Lower capacity load cells can be used with any machine for better load resolution. Grips can be selected from wide range available for diff application. 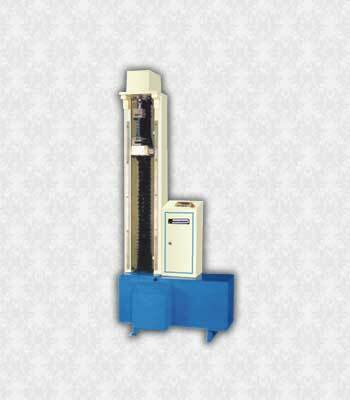 Load cells of different capacities are available as optional items. Compression, Bending & flexural attachment to suit specific tests is available as optional. A.C. Variable speed is available as optional. Power Requirement 0.5 H.P. 1.0 H.P. 1. SEG 5.1 For dumbell shape specimen of PVC, rubber and polyethylene Inserts knurling. Max. Specimen size - 35 mm wide x 4 mm thk. 2. SEG 5.2 For strips of PVC Rubber and polyester films. Inserts with rubber lining. 3. SEG 5.3 For plywood and asbestos. Inserts with fine knurling. 5. SEG 5.5 For rigid metal strips inserts with knurling. 6. SEG 5.6 For flexible metal wires 20 SWG and finer. 7. SEG 5.7 For flexible rubber cords between 10 to15 mm dia.